These interesting old maps are called by many names: property-owner maps, homeowner maps, cadastral maps, landowner maps, or Beers maps (because several members of the Beers family were engaged in the map business in the late 1800s). If your genealogy involves ancestors who lived in New England, New York or Pennsylvania in the late 1800s, an old map may be a great addition to your family scrapbook. If you know where your great-grandparents lived in the late 1800s, one of these old maps may show the location of their house with the family name appearing beside it. If you own an old house, these old maps may show the name of the owner. Besides showing the homeowners' names, these historical town maps show school-houses, churches, businesses, blacksmith shops, sawmills and gristmills, livery stables, railroad tracks and stations, bodies of water, and many other local features. See how your town looked in the late 1800s. 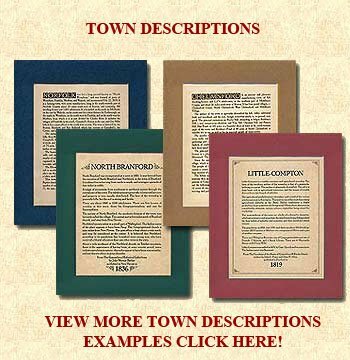 These reproductions of antique maps of towns in Massachusetts, Maine, Vermont, New Hampshire, Connecticut, Rhode Island, Pennsylvania and New York are great gifts for anyone interested in genealogy, family history writers, hikers, bikers, treasure hunters, local history enthusiasts, real estate agents, town employees, owners of old houses, people who love their town, former New Englanders, retirees to Florida, and many others. 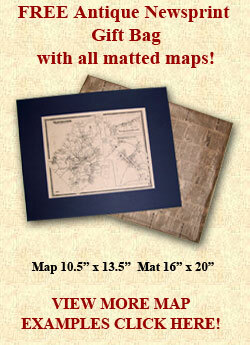 All maps are between 10 by 12 inches and 10 by 16 inches, and all are available in 16 by 20 inch mats. Historical Ink also produces excerpts from antique gazetteers written in the 1800s, describing the towns of New England. They are typeset in attractive old typefaces, reproduced on parchment, and matted to 11 x 14 inches. The gazetteer excerpts/town descriptions include interesting information such as the location of the town, type of soil, the tax rate, names of hills and streams, the number of dwelling-houses and church edifices, the origin of the town name, information about local industrial and agricultural pursuits, etc. Some list names of early settlers and early town officials. Each one is unique; anyone who loves a town will enjoy reading about it in days of yore. This Atlas will contain complete and accurate Plans and Maps of every Town in the County, showing the Roads, Streams, Town-Lines, Railways, Houses, Shops, Mills, Churches, School-Houses, &c., with name of owners of each. Also City and Village Plans, giving every street and building, public and private, together with a complete Business Directory of every subscriber, and other valuable historical and statistical information, &c., &c. The whole is to be bound in book form, with solid covers, for convenience and protection. This Atlas must be of great importance to every citizen of the County. Messrs. Colby & Caldwell: Please furnish me one copy of the above Atlas, for which (when delivered) I hereby agree to pay the sun of ten dollars cash.